Horse Not For the Course? Despite a couple of concerns, Rick Dutrow Jr. is confident that with Boys At Tosconova he has a horse that will be a leading contender Kentucky Derby (gr. I) contender by the time May 7, 2011 rolls around. Though not blessed with the ideal 10-furlong pedigree, Dutrow is not troubled about Boys at Tosconova's ability to get the distance. And even though he admits that Uncle Mo, who squashed Boys At Tosconova by more than four lengths in the Grey Goose Breeders' Cup Juvenile (gr. I) last month, is better right now, he is optimistic that time will help close the gap between the two rivals. Neither of those two things bothers Dutrow right now. According to him, the thing that concerns him most is the dirt at Churchill Downs. "Ramon (Dominguez) didn't think he handled the track well," Dutrow said on Dec. 14. "He said he was fighting it the whole way and had his ears pinned. He definitely likes other tracks more. Both of his losses have been at Churchill, which isn't good. But there is nothing we can do about it because they run the big race there. I might be praying for rain that week." Boys At Tosconova, who was second in his racing debut in the April 30 Kentucky Juvenile (gr. III) at Churchill, has had three easy works since the BC Juvenile including his last one on Dec. 9 at Gulfstream. He will likely remain in Florida until the Derby and will have only two preps. Dutrow said the first one will be the one-mile Holy Bull (gr. III) on Jan. 30 at Gulfstream. The plan after that is the Florida Derby (gr. I) on April 3. The trainer believes that's all he'll need to be ready to fire his best shot at the Triple Crown. "We give him plenty of time between races. It's not like we drill him every day," said Dutrow when asked about his decision to keep him in training at the end of his 2-year-old season rather than give him some time off. "He's fresh and fast, and he should hold up all year. "He doesn't need a ton of work, it's not like he carries a ton of weight. He's a simple horse to train." Boys At Tosconova, who broke his maiden by 12 at Belmont and then won the Hopeful (gr. I), was expected by many (including myself), to give Uncle Mo a fight in the BC Juvenile. But it turned out to be no contest, as Uncle Mo ran him into the ground in one of the most impressive Juvenile performances ever. The good news is that Boys was well clear of the rest of the field. The bad news is that he will likely have to face Mo again on the first Saturday in May. "He ran away from us, no doubt about it," Dutrow said of Uncle Mo, who will not run in the Holy Bull and will probably go in the Wood Memorial for his final prep. "We'll hopefully take another shot at him (in the Derby), but it's not like we want to run against him now." 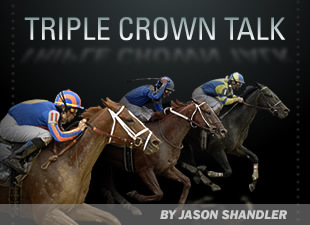 Though not as good as Boys At Tosconova right now, Dutrow has another 3-year-old that he is hopeful will make a splash on the Triple Crown trail. He is Rustler Hustler, who will make his graded stakes debut in Saturday's CashCall Futurity (gr. I) at Hollywood. A son of Ecton Park out of the Cozzene mare Cozzy Temper, the chestnut colt was bought privately by a group led by Paul Pompa Jr. after winning the Aug. 14 Continental Mile on the Monmouth turf. Previously trained by Tim Hamm, Rustler Hustler won the two-turn Gnome's Gold Stakes on the Belmont turf Oct. 31 in his first start for Dutrow and also has a maiden victory on the Presque Isle Downs synthetic surface. Dutrow is expecting him to run well this weekend and would like to try dirt after that. "The horse is doing really good," he said. "In (the Gnome's Gold) he blew the break and still won pretty easily. He trains very well on dirt, so I would run him on it in a minute. We'll see what happens Saturday and go from there."